You have less than 24 hours to flip MetLife Stadium. Go. 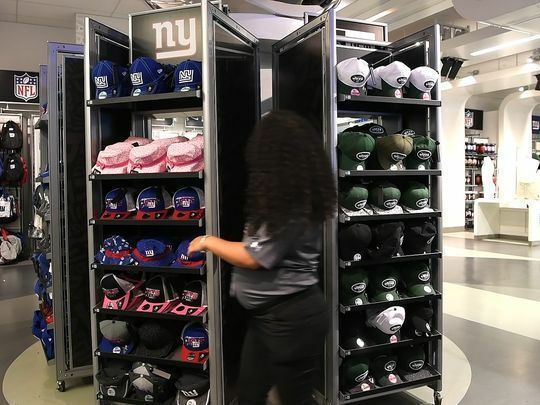 It was 10:50 p.m. Friday, 22 minutes after the New York Giants lost their first preseason game to the Pittsburgh Steelers, when the last two fans left the stadium store and walked into the summer night. Cara O’Connor, the stadium’s head of retail merchandise, watched the door shoosh closed behind them. In less than 24 hours the New York Jets would play their own first preseason game, against the Tennessee Titans, in the same building. By that time every cap and every #1 oversized foam finger had to be swapped from Giants red-and-blue to Jets white-and-green. O’Connor stood on her tiptoes and gave the order. There are 31 stadiums in the National Football League. Only one of them flips. Aesthetically, MetLife Stadium is a uniquely unlovely building, with an exterior that resembles a highway guardrail bent back on itself and an interior with all the grey charm of an airport security checkpoint. Functionally, however, the stadium’s ability to flip makes it a minor marvel. Under normal circumstances the job of cleaning the stadium and changing its end zones, banners, billboards, light scheme and retail stores takes about two days, said Mike Alperstein, the director of operations. This weekend is not normal. 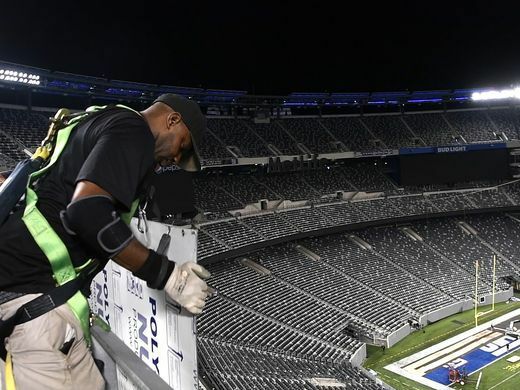 From the time the Giants’ game ended at 10:30 p.m. Friday to the Jets’ kickoff, scheduled for 7:30 p.m. Saturday, workers had a little more than 20 hours to transform the entire stadium, which envelops 2.1 million square feet and seats 82,500 people. “It’s a big job,” Alperstein said. They’re capable of doing the job even faster. Last year the staff had to transition from a Friday Jets game that started at 8:25 p.m. to a Saturday Giants game at 1 p.m. To make matters worse, said facility manager Steve Sansonese, it was snowing. “It’s not as fun out here when it’s cold,” he said. The timing was so tight, in fact, the stadium’s managers decided they didn’t have time to flip the end zones between games. Instead they kept the same generic turf, decorated with nine white diagonal lines rather than the teams’ logos, in place for both games. This weekend’s changeover, in contrast, was a “full flip,” because the end zone color schemes changed in sync with the rest of the stadium. And the timing this time was tight because weather forecasts predicted heavy rain at 2 a.m.
That left Alperstein and his dozen men just three hours to lift the Giants’ turf off the ground and begin to lay the Jets’ turf in place. “The guys are really hustling tonight,” Sansonese said. 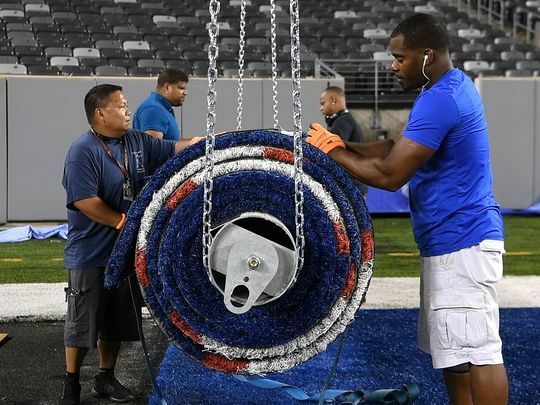 MetLife Stadium operations crew members secure the rolled up New York Giants' end zone to make way for the Jets' turf. Normally workers replace one end zone at a time, Alperstein said. To speed things up this week, two crews worked both ends of the field simultaneously. It created a strange scene. Most people experience this enormous amphitheater as a cauldron of noise. But on Friday night the only sounds came from the forklifts and cranes, which beeped as they drove in reverse and bellowed diesel grunts each time they lifted sections of rolled-up synthetic turf. Otherwise the bowl stood empty, grey and silent. Back in the stadium’s main retail store, Jamie Mathus of Saddle River worked next to Peter Mathus, her twin brother. Jamie kicked a pin near the floor with her right foot, jerked a rack of blue Giants T-shirts to the left, and suddenly the entire column spun counter-clockwise, revealing a wall of green jerseys in back. Behind her, Peter removed blue sweatshirts from hooks, dropped them to a low shelf, and reached below the shelf to pull open a drawer filled with identical analogs, only in green. Many Jets fans still appreciate the team’s history as the working-class upstarts to the blueblooded New York Football Giants, a team that keeps “football” in its official name to distinguish itself from the New York Giants of baseball, which haven’t played a home game in New York since decamping to California in 1957. Here in MetLife Stadium, though, romantic notions like history and team loyalty fade quickly. The anonymous grey architecture of the stadium, which might be plunked just as easily in Dallas or Tampa or Beijing, lends the proceedings a feeling of cool interchangeability. The grit of Joe Namath, who limped across the goal line of a different stadium in November 1974 to help defeat the Giants in the NFL’s first overtime game that didn’t end in a tie, here is forgotten. The logic of efficient corporate brand management rules the night. Sansonese was asked whether he sometimes feels the chills, working in a place that serves for many people as a kind of civic cathedral. Which is not to say that a full flip night is devoid of magic or surprise. To reduce static electricity before the Jets’ kickoff, Sansonese said, the entire field would be sprayed in Downy fabric softener.